In a dystopian dance of complicated relationships, some laws are meant to be broken. Laws of Attraction will use modern dance to explore the complexities of human relationships through the physics of the world around us and the weak force that binds us. Throughout the creative process, the artistic team has been exploring physical metaphors for common phrases used when describing relationships. Nothing can pull us apart. Why does everything have to revolve around you? I’m tired of these ups and downs. These phrases became the inspiration for vignettes that bind together intricate and athletic dances inspired by polarity, proximity, measurements of time, and even particle physics. Laws of Attraction will feature company dancers Kaitlin Dann, Nile Alicia Ruff, Dane Toney, Anthony Williams and Ashley Williams, with live music accompaniment by frequent collaborator Ian Green. Parking: There is one parking lot available on Tustin Street between Gist and Miltenberger Streets (as directed by Attack Theatre signs). If there are no spots available, please park along Forbes Avenue. Click here for a map of the parking lot. Nile Alicia Ruff grew up in Washington DC. She studied West African dance, ballet, jazz, hip hop, tap, Graham, Dunham and Horton. She attended the Duke Ellington High-School of the Arts and upon graduation went on to attend Point Park University. At Point Park she performed works by Robert Battle, Martha Graham, Christopher Huggins, Jose' Limon, Kyle Abraham, and many others. She graduated with her BFA in 2014. Nile attended The Ailey School on scholarship and did intensives at Paul Taylor, Merce Cunningham, Washington Ballet, and Deeply Rooted dance Theatre. This is her first season with Attack Theatre and she is truly grateful for the opportunity. Anthony Williams, a Chicago native, is a Pittsburgh-based dancer, choreographer, and educator. Anthony has a strong investment in his community, and his work is a reflection of who he is as a community member, artist, and an advocate for social justice. His ongoing commitment lies in the empowerment of the oppressed and facilitating the discovery of self through art making and process. As a full time dancer with Attack Theater (Pgh) he is excited by the possibilities of movement as a tool to unlock play, power, and potential. Anthony has performed with Congo Square Theater Company (Chicago), Staycee Pearl dance project (Pgh), Texture Contemporary Ballet (Pgh) August Wilson Center Dance Ensemble (Pgh), and Deeply Rooted Dance Theater (Chicago). As a choreographer, he has created original works for Carnegie Mellon University’s Infra Dance Company, Reed Dance, Hope Academy, and Dreams of Hope. In 2015 and 2013, Anthony premiered work at Kelly Strayhorn Theater’s newMoves Contemporary Dance Festival. In 2014, he was selected as a Kelly Strayhorn Theater Fresh Works Residency artist for the development of Loving Black, which was supported by The Heinz Endowments, Pittsburgh Foundation, and Greater Pittsburgh Arts Council. He frequently collaborates with vocalist Anqwenique Wingfield and in 2014 his choreography was featured in her performance “On The Edge of Night” alongside musician Daniel Bernard Roumain and poet Yona Harvey. Ian Green is a musician, visual artist, massage therapist and native to Pittsburgh. 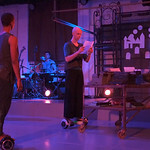 Ian has written and performed music for Texture Contemporary Ballet, Murphy/Smith Dance Collective, Pittsburgh Ballet Theatre School and this is his fourth collaboration with Attack Theatre. He regularly accompanies modern dance classes with Attack Theatre. Ian received his Master’s Degree in Painting from Indiana University in Bloomington. He has created murals for the Carnegie Library of Homestead, as well as various outdoor public artworks and private commissions.